I’m lucky enough to be really great friends with my hair stylist, the lovely Ashley Jarrel. She has been with J Thomas Salon in North Georgia (that's my hair on their homepage y'all...I'm famous!) for years, building her client base and brand. You can follow her work (and life with her sweet family) on her Instagram account. I’m even luckier that I've been able to fly home every 2 months this past year for her to give my hair a refresh. However, with another baby arriving soon, I’m sure I’ll be traveling a little less, leaving me to try and find a connection with a stylist in Boston. I’m sure many of you are in a similar situation, having jumped around to a few different stylists trying to find the right fit. So, I asked if we could get together (outside of the salon) where I could take some notes (and photos of course!). After talking hair for almost an hour, we came up with 4 different categories –Communication, Hair Care, Blow Drying/Styling, and Trends. I've included a Q&A format below to give you insight from my favorite hairstylist. **Many thanks to my mom for juggling our 3 girls while we talked AND taking all the pictures for me! Q: We’ve all done it, myself included, taking a picture to your stylist and asking them to replicate the style on you. What are your feelings on clients bringing in inspiration photos? Ashley: Photos are great, but I encourage people to keep in mind that those photos have been heavily edited and commonly have filters on them giving the color/highlights even more of a pop. Much like magazine photos are touched up, no one’s skin is that perfect, and in the same way, no one’s hair looks like that every day. Just remember to keep expectations realistic for YOUR hair. Q: What's the best way to explain what I’m looking for? Sometimes I feel like what I want isn’t communicated correctly or maybe the stylist misunderstands. What’s the best way to avoid this? Ashley: Make sure you and your stylist have a rhetorical conversation. When you sit down in the chair, take as much time as needed to really explain what you want. After you explain what you are wanting, be sure your stylist understands by communicating back to you what he/she believes it is you have in mind. Many clients sit down and get a little gun shy about saying what they are looking for, or freeze all-together and forget what they had been planning to tell me all week! If you are the type to freeze up in the chair when it comes time to communicate, maybe write it out beforehand for yourself. Also, if it takes 10 minutes to really talk through it all and come up with a clear plan, that’s ok! - and also necessary sometimes, especially if there is going to be a drastic style change or intense color choice to be made. We want you to be happy, so if it takes some time in the beginning to communicate well, that’s part of it, we are in the client service industry after all! Q: If we are completely finished, and it's not exactly what I had envisioned is it rude to ask your stylist to "tweak" the style? Ashley: Not at all, we love having you in our chair, but we love it even more when you take our work out into the world with all the confidence. Simply ask us to, "go a little shorter," "give it a little more A-line angle," or "add a few more highlights." Do keep in mind though your stylist may have another client waiting, so they might have to ask you to wait a couple of minutes before you can get started adjusting your style. Q: I’m all over the map when it comes to hair care. If someone wants to start a better at-home hair care routine, what are some of the most important steps? And is it even important? Ashley: Hair care is much like skincare – so important!! First, salon level products are worth the investment. They are designed to work with the hair treatments you receive at the salon and will protect your color and ends, making the money you spend at the salon last longer. At J. Thomas Salon (in Georgia), we use Kevin Murphy products, but I would suggest any salon-grade product versus an over-the-counter version. In my opinion, your shampoo is more important than the conditioner. Of course pairing the two is best, but if you must choose, invest in a quality shampoo. If you have fine hair, you can mix it up and do a hydrating shampoo with a volumizing conditioner - just ask your stylist what they suggest. Also remember that in the summer you want to focus on strengthening and protection. While in the winter, you want to hydrate. If you are choosing a mask for your hair, always go with a moisturizing mask over a protein mask. Q: Let’s be honest, not many of us have the time to give ourselves a great blow-out and style our hair every single day. How do we make all that effort last for at least a few days? Ashley: Much like the products as I just mentioned, the tools used are just as important. Ask your stylist advice on blow-dryer, hairbrushes, curling and straightening irons. Q: What are you seeing in salons and classes these days? Ashley: For trends, Europe leads California and Cali leads the East Coast. So if you want to be a “trendsetter” look to Europe or California first, your friends on the East coast will probably start following the trend 2 years later. We are seeing a lot of natural, long, tousled hair with less obvious style (although it’s most likely been styled because even the tousled look is intentional). Blunt cuts (even on long, layered hair - as pictured above) are very popular, giving hair an edgier, undone look. Finally, the bob cut will never go out of style in my opinion, it gets reshaped every few years, but it’s here to stay. Color is remaining simple and natural in placement. Even the vivid colors are being placed in a natural way. Now that you've now read tips on Communication, Hair Care, Blow Drying/Styling, and Trends, I want to leave you with a few braiding tips. After curling my hair, Ashley decided to put it in a loose braid down the back. Your hair will do better if it is styled just a bit with some texture spray or cream and maybe even has a few curls in it. If you look close enough, you can see that there are small elastics in the beginning layers. She took sections of my hair, placing them in the elastic, and then splitting the hair in the middle and turning the grouping in and pulling through the split, to create the twist look. 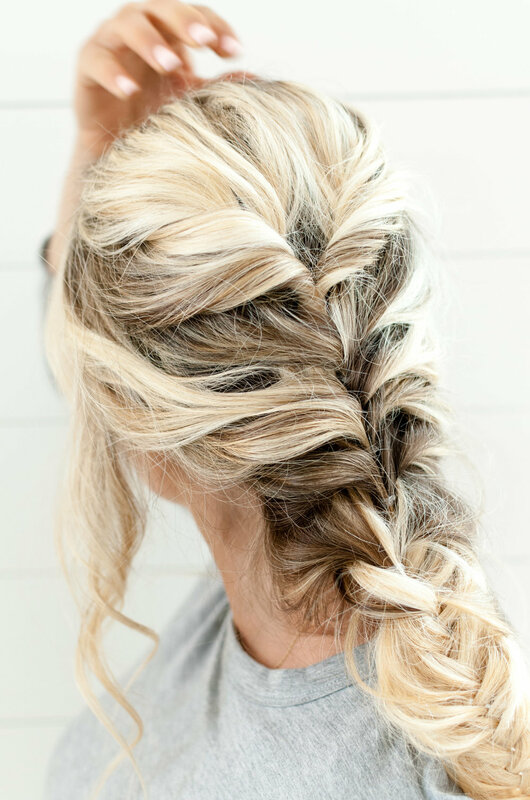 Ashley repeated this several layers down my head and then finished it with a simple braid. Finally, she pulled it all out - this is the trick, y'all! 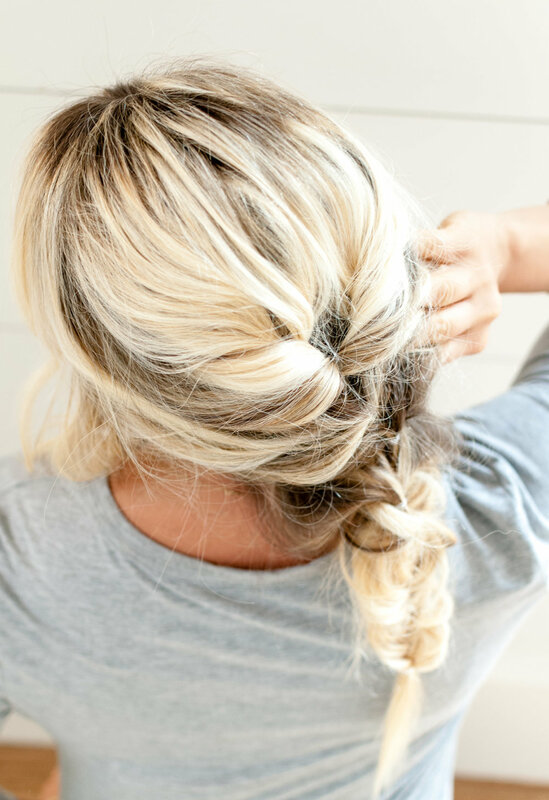 Work the braid pulling up, down, in, out, until the look you desire is achieved. And I highly suggest pulling a few strand out around your face, even long messy ones. Unfortunately, we didn't think to take pictures of this process but hopefully these are detailed enough to help. I am thinking about doing a how-to braid style post...probably with Paul just photographing me braiding my hair in steps.